Now that the temperatures have warmed up, we want to enjoy more raw meals. Today we had this raw soup with our lunch. It was delicious, full of tasty vegetables and sweetened with an apple. Carmella, at the Sunny Raw Kitchen blog is an amazing raw “cook”. Her recipes are always very tasty and the instructions easy to follow. She adapted this recipe from the Raw 50 cookbook. 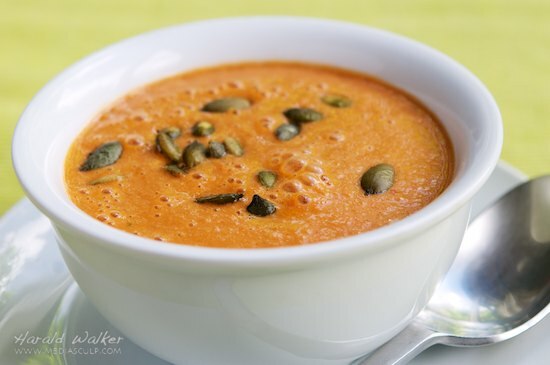 As we really enjoyed this recipe we give the link to her soup index page, where you have to scroll down for this Red Pepper Curry Soup. Posted by Chris Walker on July 18, 2012 in Apple, Avocado, Bell Pepper, Reviews.